Dorothy and her English students at the end-of-year party. We are south of the equator, so this time of year is our summer. It has been very hot and unfortunately seriously dry. Our church work, however, has NOT been dry, but lively and refreshing. Presbytery meetings here are held yearly and last from Friday to Sunday, beginning with committee meetings on Friday afternoon. We have only seven churches in our presbytery spread out over this large state. The last few meetings have been in a meeting center in the capital, Salvador. We hosted the January 2017 meeting. It was a wonderful experience for us and those who attended. There were about 40 people there. Our church members have the gift of hospitality and are realizing they can serve the Lord by opening their hearts and homes to others. They are good cooks, so their meals are delicious. The attendees spent two nights and ate five meals with us. They slept in our homes and ate together at the church. Our church used to have an elementary school, so it has a small but nice kitchen in which large meals can be cooked. The presbytery meeting began with a meeting of the Adult Group on Friday afternoon. Several years ago, the Women’s Group and the Men’s Group merged into one group, the Adult Group. The presbytery meeting continued with discussion concerning issues for all the churches. We divided into the committees that deal with the issues. The committees read the pastors’ and committees’ reports of their work and then they read their summarized report to the whole group, where important decisions were acted upon. Our church has reinstated the Adult Activities Group. This group offers a variety of activities, including two “diaper showers” where people bring gifts of diapers for needy women, a monthly food drive, a service celebrating International Women’s Day, and a week of prayer meetings. The prayer meetings were an enriching experience, uniting the church members. We learned about different examples and types of prayer and ways prayer is used in the Bible. We talked about how we could enhance our own prayer lives and develop prayer into a deeper part of our lives. We had about 20 people each night. We met in homes so people could walk to the meetings as most church participants don’t have cars. In Sunday School, the adults are studying the book of Proverbs and the children are learning about the life of Jesus. We are reading Timothy I and II in Bible Study on Thursday nights – a lot of learning is taking place. The schools are now on summer vacation. 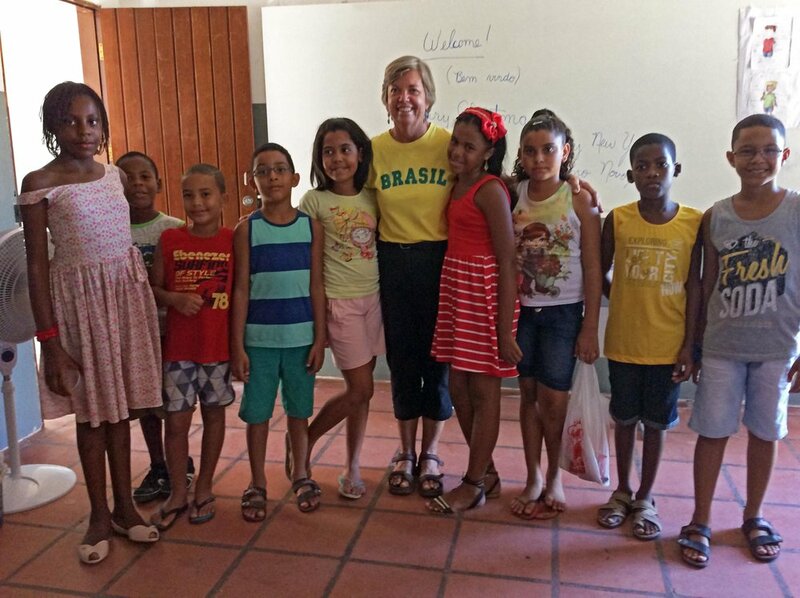 Before vacation began, the children’s English classes had an end-of-year party. The students sang and performed the song “Head, Shoulders, Knees, and Toes” because they had learned the names of the body parts. They enjoyed an American snack – chocolate chip cookies. We have other types of snacks and cookies here, but Brazilians always enjoy chocolate chip cookies. The adults wanted their classes to continue during vacation, so they have. Dorothy also tutors two adult groups. One of her students is an elder from the church who is in her 70s and another is a “stay-at-home mother” who worked until the week before her daughter was born, so she was a little scared to stay at home, but she loves motherhood. She was a teacher and taught middle school, including English. She is studying to improve her English with the hope of obtaining a job in the future. She previously studied with an Australian woman, so her English is a bit different from ours. Her six-month-old daughter Isabella also participates in class with a smile, google or cry. A new school year begins soon, and many people will be returning to “normal routines.” Please pray that the church will be a part of their routines. Thank you for your prayers and your financial support. Your gifts enable us to continue our work here, bringing the love and joy of Christ to these people. May the Lord bless each of you daily.